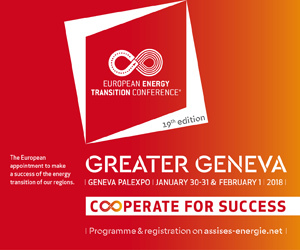 From 30 January to 1 February 2018, the cross-border conurbation of Greater Geneva will be hosting, at the Palexpo Exhibition and Congress Centre, the 19th edition of the European Energy Transition Conference. Close on 3,500 participants – representatives of the public authorities, the economic and academic worlds and the civil society, are awaited to exchange views on and discuss their commitment to energy transition around the leitmotif « Cooperate in order to make a success of energy transition ». Through a programme made up of over a hundred appointments – plenary sessions, workshops and theme visits, the event proposes to go beyond sector-based approaches and open up to the multiple transitions that are pushing back the technological and institutional limits. At COP 23, Antonio GUTERRES, the UN Secretary General, called for a « coalition for action in all sectors to combat climate change ». At the 2018 Energy Transition Conference, the governments and energy transition players will express their views on these major issues and share their experiences and solutions. Launched in 1999 by the Dunkirk Urban Community and ADEME, then co-organized by Bordeaux Métropole and the Greater Geneva Cross-Border Conurbation, the «European Energy Transition Conference» has become over the years the annual must for the European local players committed to energy transition. Organized following on from governmental high spots – and in particular the UN Climate Change summits (COP), the European Energy Transition Conference is the opportunity for the local governments and players to appropriate collectively the new national and international issues, share successful experiences, create new tools and ways of cooperation in order to implement energy transition in a concrete and concerted way at the local level. Over 3 days the European Energy Transition Conference offers the participants a multi-format programme alternating the supplying of information with the exchange of views, a time of inspiration with a time for co- construction.  13 plenary sessions to debate the current major energy transition issues.  Over 110 workshops, thought up in collaboration with the local players committed to energy transition, to make the Energy Transition Conference a veritable laboratory of experience and idea sharing and production of concrete solutions. This year no fewer than 250 speakers from all over Europe – elected representatives, citizens, researchers, companies or again local technicians have contributed to produce this programme, via a call for contributions launched last June.  6 theme visits to discover energy transition in action. Energy renovation of a co-owned property dating back to the 1950’s, cold and heating network of a district set in place using water from Lake Geneva or again the recovery of waste in the form of biomethane for natural gas vehicles (NGV): so many exemplary and innovative initiatives to be discovered, implemented in the cross-border area of Greater Geneva. Full programme on www.assises- energie.net (prior registration mandatory – number of places limited). o Flashback on the significant events in 2017, in particular in the presence of Roberto BOCCA – Director of the energy sector of the World Economic Forum. o Political plenary session on the implementation of the Paris Agreement with speeches from Miguel ARIAS CAÑETE (subject to confirmation) – European Climate Action and Energy Commissioner, Doris LEUTHARD – Swiss Federal Advisor, Head of the Federal Department of the environment, transport and energy, and Nicolas HULOT – French Minister of Ecological and Solidarity-Based Transition. o Deciphering of fiscal and economic issues through 2 plenary sessions: « Economic theories and Energy Transition: the dictatorship of prices? » and « Disinvesting and reinvesting private and public finances ». o At the end of the day, showing of the film Solar Impulse in the presence of Bertrand PICCARD – the solar aviation pioneer. Make way for dreams and imagination! o Opens with an « Important testifier session », entitled « Dreaming the transition, when reality exceeds storytelling », in the presence of Cyril DION – co-producer of the documentary « Tomorrow » and co-founder of the Colibris association. o Political session dedicated to the European Energy Award label and its French equivalent Cit’ergie – which is celebrating its 10th anniversary this year. 3 local authorities honoured with the European Energy Award GOLD (highest distinction of the label) will talk about their experience with this programme. o Bruno LECHEVIN, Chairman of ADEME (Agency for the environment and the control of energy), will give the Cit’ergie label awards to the local authorities having obtained them in 2017.
o Presentation of the cooperative and citizen project for the carbon neutrality of Louvain in 2030 – « Leuven 2030 ». o Sheddinglighton2majorcurrentissueswithaplenarysessiondevotedtothe«energystorage revolution » and another dedicated to the subject of the management of the « quality of the air ». How can energy transition get the public to back a development project? o Opens with a plenary session led by 4 European regions – Lombardy, Catalonia, Baden- Wurtemberg and Auvergne-Rhône-Alpes, which are cooperating to promote an ambitious common agenda for the regions of Europe and for the European policy of regional cohesion (« Four drivers for Europe » project). o Plenary session dedicated to the social impact of the implementation of energy transition in an area. o CrosstestimoniesfromUNrepresentativesandimportantCOP21,22and23testifiers,inorder to shed light on the essential links between the local players and the international authorities for the implementation of energy transition. o Lastly, time for reporting on the Volteface project with feedback on the four years of research work into the social factors governing energy transition. Energy transition causes new sectors and new jobs to emerge. Nearly 60% of pupils will do a job tomorrow that today does not yet exist. A veritable « event in the event », the « Energy Transition Jobs Forum » spotlights this vocational revolution. Over 3 days, at Palexpo, the employment and training players of the France-Vaud-Geneva conurbation, together with the companies and professionals in the energy business will welcome the public in order to inform them about and sensitize them to the job and training prospects in the sector. Presentation of the energy transition jobs through numerous information stands, testimonies and demonstrations by professionals and the showing of feature-length and short films. Focus on the initial and in-service training that lead to jobs in the energy transition sector through information stands and the showing of short films. Recruitment on apprentice contracts will be offered on the spot for vacancies in the area. Morning of reflection for university dons, researchers, companies and public authorities, on the vision of future jobs in the energy transition sector through a workshop made up of a dozen theme shops.